I have looked on the Tiger Canyons site, and have been unable to find a current list of tigers, let alone an up-to-date family tree for the tigers. For instance, the father of Panna's cubs, Khumba. Where did he come from? Is he a tiger that is completely unrelated to the Panna, or is he related to her? There should be no reason why the only available data on the tigers, other than mentions in newsletters, is over 4 years old. There's nowhere to learn of births and deaths. And if I'm going to get invested in an animal, I want to have regular updates on them, without having to scour each and every update on the off chance that tiger might be mentioned. You have the time to write all those newsletters, but you can't even do at least a yearly update on the major events that have happened to each tiger? Why not have a sub area where all the information for the tigers in kept, with separate pages for each tiger. Have how old the tiger is, their history, who their relatives are, how big their territory is, how successful that are at hunting, how shy they are, who their neighbors are and if they're had any major fights with them. That way, if someone saw a video about Panna, or Corbett, or so on and wanted to know more about that tiger, they could simply click on that tiger's page and find out all about them. The idea that if I want to learn more about one of the tigers I have to trawl through every single newsletter ever released on their site for just a few mentions of an individual tiger has completely turned me off the idea of finding out anything about your tigers. You trumpet that you're focused on conservation, but without a diverse gene-pool, you're dooming the tigers that will be born in the future to having short, illness stricken lives. Just looking at the current state white tigers are will demonstrate that. All white in captivity that come from a 'pure' line originate from four individuals which were intensively inbred so that they could ensure that all cubs born would be white. And the tigers have suffered from it. It has happened time and time again that when a gene pool narrows too much, defects will show up. Just look at pedigree dogs. There isn't a single breed of pedigree dog that doesn't have health issues. If you're really serious about conserving tigers, rather than just using them as an attraction to bring visitors to your park, then you must ensure that inbreeding is prevented. And inbreeding doesn't just mean matings between siblings. It also means matings between cousins and second cousins. As tigers aren't native to Africa, unlike with lions you can't simply exchange animals with another park. And as your tigers aren't part of the tiger studbook used by zoos, you can't bring in an unrelated individual from a zoo or park to boost genetic diversity. As that is the case, why not get together with conservationists and scientists to see if your tigers can be used as a case study for artificial insemination of wild tigers? Not only would this allow the genes of completely unrelated males to be introduced into the park, but it would also be a major contribution to saving tigers world wild. Most wild populations of tigers are fragmented and isolated, meaning that to prevent inbreeding animals have to be moved from park to park. This has a lot of risks attached. But if conservationists could simply collect sperm from say a captive male and use it to inseminate a wild female in an area with a low tiger population, it could very well save the species. I hope that you can read this email with an open mind and not see it as me dumping on you, but in the spirit with which it is intended, as constructive criticism. I do think the work you're doing is important, but if even one aspect of it isn't putting the tigers first, especially an aspect that could so negatively affect them in the future, then it needs a serious rethink. I agree with your first paragraph. Our web site needs updating, we will do this soon. Thank you for all the good ideas. I wish I could play the trumpet, I only play guitar & harmonica. Any tiger that is inbred, is vasectomised or sterilized. We have a cub introduction system whereby we introduce cubs not related into the litter & thereby keep our genetics diverse. In the case of Khumba, when the cub introduction failed (I could not find Shadow’s den), he was hand raised. Khumba has fathered cubs with Panna & Oria giving us excellent breeding stock. Therefore, your comment about short, illness stricken lives, is incorrect. Julie lived to 14, Shadow is 12, Ron was 12, Seatao was 10, Sunderban is 9, Panna is 9. So, our tigers are living a long time. We have had no illnesses, only a bite from a Cape Cobra claimed Seatao’s life. "Just looking at the current state of white tigers I will demonstrate that all white tigers in captivity that come from a 'pure' line, originate from four individuals which were intensively inbred so that they could ensure that all cubs born would be white. And the tigers have suffered from it. It has happened time and time again that when a gene pool narrows too much, defects will show up"
All white tigers came from a white male tiger called Mohan who traveled from India to USA in the 50’s. The first white tiger was Shine, who was killed by hunters trying to steal her for a canned tiger hunt. The second white tigress is Tibo who is still alive & has produced three cubs that have dispersed. Our policy at Tiger Canyons is to preserve the rarity of the White tiger & therefore, we are concentrating on wild born, wild raised, self-sustaining, normal tigers. A group of scientists at Wits University believe the Tiger was in Africa & went extinct. These scientists believe that in time with fossil evidence, they will prove the Tiger was in Africa. The Wits scientists hypotheses is that the Tiger after being widely spread, crashed & small population survived in Asia. It is from this population that the modern tiger evolved. This would explain why there are no Tigers on the island of Sri Lanka. The land had split from the mainland by the time the remnant population radiated outwards. Artificial insemination has been tried before by others, with disappointing results. It is expensive, difficult & very invasive. Because of canned tiger hunting in South Africa, (Lion canned hunting is legal; Tiger canned hunting is illegal) there is a wide genetic variety of Tigers in South Africa. Therefore, natural mating and cub relocation as explained, is a far better option. India is a perfect example of where the island scenario is emerging. Tigers have recently gone extinct in Sariska & Panna & no cross pollination of genes between parks like Rhanthambore, Kanha & Bandhavgarh exists. Indian conservationists would do well to examine cub relocation. A non-related cub can be sourced & the Tigress can be darted & the non- related cub introduced into the litters. 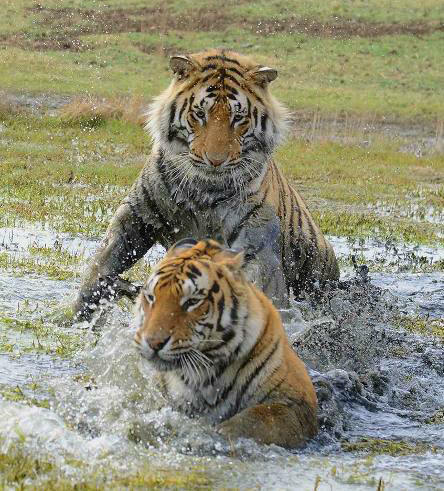 I have had success with both lion & tiger using cub relocation. However, my fear is with India’s huge human population (India is through 1.4 billion) and it’s notorious bureaucracy, this kind of forward creative thinking will never materialize in India. Several senior Indian government officials and conservationists will be visiting Tiger Canyons in the near future & I will certainly be showing them how cub relocation works. However, I’ m not holding my breath. I don’t quite understand this remark. Have you ever been to Tiger Canyons? Have you ever sat down with me & discussed my management policies? I have spent the last eighteen years of my life living in a dilapidated house. Every cent I have earned has gone into land, fencing & prey for the tigers. I could quite easily stay at Londolozi & live in luxury. My reward is a spiritual one. I get to interact with this magnificent cat on a daily basis. I get to see young cubs mature, disperse, mate & have cubs of their own. I also have the sorrow when one of the tigers dies. So let me ask you, apart from sitting behind your computer, what have you done for Tigers? Thank you for your Email, you make some constructive points.